A pact among the seniors, some line shuffling by the coaches, heavy duty talent at the forward position. As simply as that, there’s your winning combination for Holy Angels. 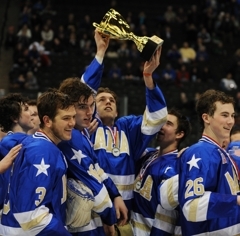 The Stars, who lost two of their first three games, are the Schwan Cup Silver Division champions after reeling off three straight victories, the latest of which was a wild 8-5 triumph over Cretin-Derham Hall in the title game on Saturday, Jan. 1, at the Xcel Energy Center in St. Paul. “We had two losses, with Roseau and Elk River, and we knew that wasn’t our team,” said senior forward Cullen Hurley, who had a hat trick against the Raiders. “Mainly the older guys, the seniors, kind of came together and said that we weren’t going to lose another game. 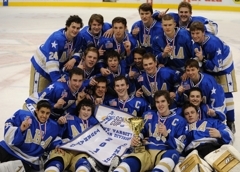 Holy Angels (4-2-0) defeated Burnsville and Blake to reach the title game, and Stars coach Greg Trebil attributed the high-scoring and at times sloppy game to playing three-high level opponents in four days. Trebil initially had Hurley playing on a line with Joseph LaBate, another high-scoring Stars forward who played in the Upper Midwest Elite High School Hockey League in the fall. After the loss to Elk River, Hurley has been centering a line with his freshman brother, Connor, and sophomore C.J. Smith. Those three combined for five goals (Smith had two) against the Raiders. 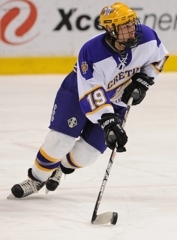 Connor Hurley, who had three assists, played last season in the Shattuck-St. Mary’s program in Faribault. “We knew we needed him because he has good hands and good vision, and he would be a good asset to our team,” Cullen Hurley said about his younger brother. 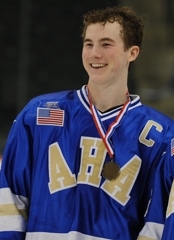 Senior Cullen Hurley scored three goals, including one in which the puck never came close to entering the net, as part of Holy Angels’ wild 8-5 triumph over Cretin-Derham Hall on Saturday, Jan. 1, in the Schwan Cup Silver Division championship game at the Xcel Energy Center in St. Paul. 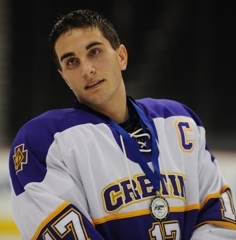 Cretin-Derham Hall’s Tony Barbato scored two goals in the first 28 seconds of the third period to tie it at 5, but Holy Angels got goals just 11 seconds from C.J. Smith and Joseph Labate 5 minutes later to take a 7-5 lead. Hurley capped the scoring when, shooting at an empty Cretin-Derham Hall net after goaltender Joe Schneider had been pulled in favor of an extra skater, the puck was knocked into the corner by Barbato’s flying stick. Because Barbato threw his stick at the puck, and the Raiders’ goaltender had been pulled, Hurley was credited with the goal to finish off his hat trick with 10 seconds remaining. LaBate and Smith each scored twice for the Stars (4-2-0). Connor Hurley, Cullen’s freshman brother and linemate, had three assists. 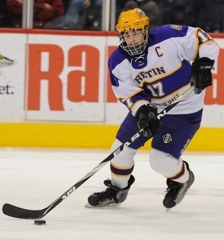 Colin O’Brien, Luke Dietsch and Anthony Tillman also scored for Cretin-Derham Hall (5-5-1). Schneider stopped 24 of 31 shots for the Raiders. Brett Pierce made 16 saves on 21 shots for Holy Angels. 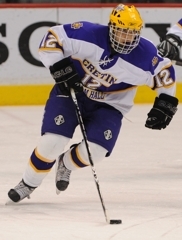 The senior forward had three goals and an assist and generally was a nonstop menace to Cretin-Derham Hall’s defensemen because of his speed and tenacity. The senior forward scored twice. One of his goals came without the use of one of his gloves, which flew off while he was fending off a Raiders backchecker. LaBate has nine goals in six games this season, seven of which came in the Stars' three Silver Division victories. Barbato, a senior forward whose motor runs nonstop, had two goals, an assist and quality shift after quality shift.